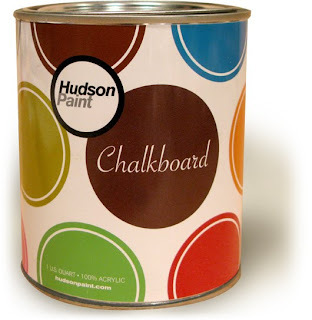 You can now get chalkboard paint in different colors! I can pretty much make every surface of my house kid friendly. Don't tell Colb, though... he already thinks I am a fanatic... in the 2 houses we have owned I have repainted rooms over 20 times! But variety is the spice of life, right? I was just looking for colored chalkboard paint last night! I'm thinking of painting the door to my basement with it so Jake can play and I can keep kitchen notes on it but I didn't want a black door! Awesome! Crayola used to make really brightly colored c.b. paint, but I can't seem to find that anywhere anymore. 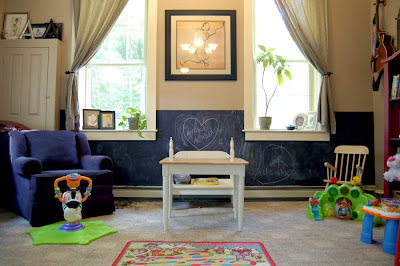 ...I love chalkboard paint...try chalkboard paint over two coats of magnetic paint...you then have a wall or a door that you can write on and stick magnets to.